These high school sweethearts love to hike. One day, on a rainy trip to the north shore, they took a long hike around Gooseberry Falls, and after a few hours, they sat down to take some pictures. That’s where Chris made his move. He told Kamaria he needed to use the bathroom, but instead, he secretly retrieved her engagement ring. Then he returned and sat down to snap a few pictures with her, and when they were finished he asked if she could help him up. She stood, and then turned around to find him on one knee, ring in hand, asking her to marry him. “It came out so fast I hardly understood what he had said, and made I him repeat it! Then I asked him if he was joking. Thank god he wasn’t!” recalls Kamaria. 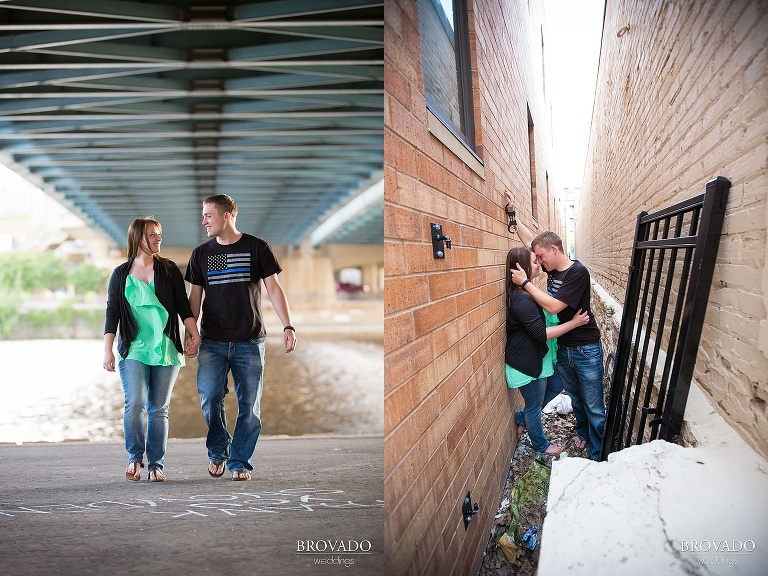 I took these lovebirds over to Father Hennepin Park to shoot some engagement photos around the Stone Arch Bridge. The light was perfect. It was a little overcast, as Minneapolis has decidedly been for most of the summer, but that’s actually preferable for outdoor photography. Kamaria and Chris’ love for hiking and the outdoors was apparent as we tromped through the various landscapes the St. Anthony Main area has to offer. 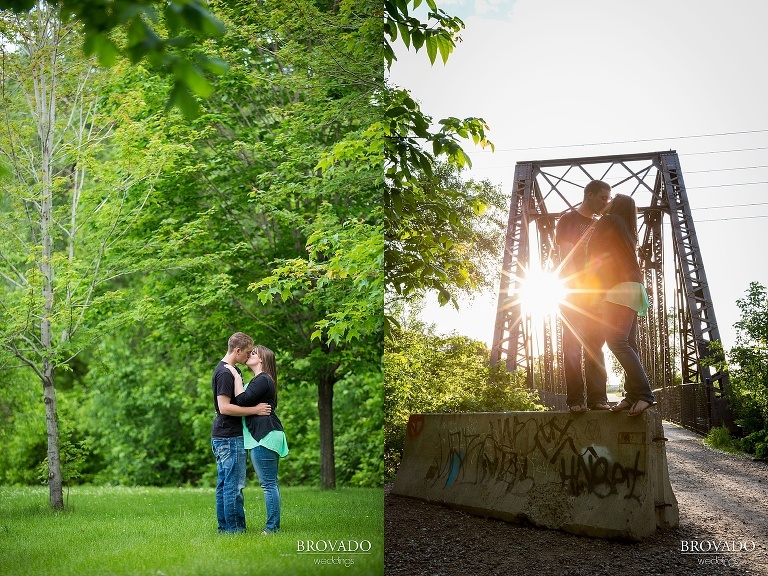 Parks, woods, railroad bridges, narrow urban alleys, downtown skyline backdrops… They had fun every step of the way, and I loved getting to know them. Even after so many years together, these two are still so in love, and it’s so totally obvious. Kamaria and Chris, it’s been a pleasure working with you. I can’t wait to photograph your wedding in the fall!